I was looking for some new frozen foods to try out when I saw the vegetable egg rolls by Pagoda. I've never been a huge fan of egg rolls, but I decided to give them a try. I went with the vegetable rolls which have cabbage, carrots, celery and bok choy. The ingredients also list water chestnuts and bamboo shoots. They come with 4 individually wrapped egg rolls per box and retail for around $3 - $3.50. Preparing the egg rolls is pretty easy. You can cook them by oven or microwave, but I always go with the microwave for speed and convenience. They recommend a time of about 1- 1:15 in the microwave. I found this to be pretty accurate at the 1:15 for a good cook all the way through for 1 roll. So how do they taste? Surprisingly good! The outside shell is very flavorful and the veggies inside taste good also. It does not even seem like you are eating vegetables because it tastes so good! The egg rolls each come with a sauce packet, but I just eat the egg rolls which have enough flavor on their own. The sauce packets are connected to each other and kind of hard to open without a scissors. The sauce has a spicy kick to it but is also pretty good if you are looking for extra flavors to go with it. Nutrition on these egg rolls is pretty good. Calories are 140 per roll and fat is 6% daily value. Each roll has 3 grams of protein. The only thing that is kind of high is sodium which is at 19% daily value, but overall it is ok as long as you eat them sparingly. I only make 1 roll at a time and combine it with other food for a meal. 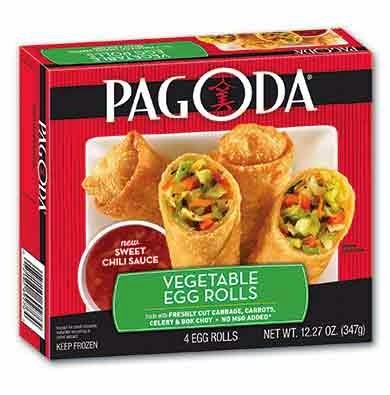 Overall I highly recommend the Pagoda vegetable egg rolls, in fact I have already gone back and purchased 2 more boxes! I will probably check out some of the other items from this brand soon.